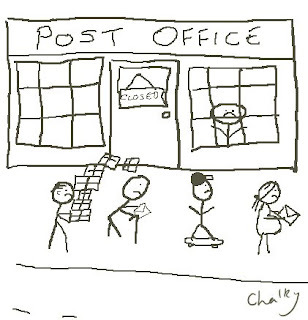 Here in the UK, our Post Offices are shutting down faster than a rat infested KFC. My nearest one is now constantly crammed full of unhappy looking people in an endless queue waiting patiently to carry out a simple task such as posting a letter or a parcel or maybe collecting their pension. Whereas I used to think nothing of popping a small parcel in the post to friends and family with say a CD or a few photos, now I think twice and usually end up not bothering, the queues are just too depressing. This got me thinking, what might have happened in the past if other people had come to the same conclusion and not bothered to get in the queue? Joe Cocker might not have ever made it home if his baby hadn’t sent him THAT letter. How would the since deceased ‘Stan’ have got in contact with Eminem to tell him how he wanted to ‘be with him’ (not that it made much difference)? Johnny Cash’s ‘special delivery tear stained letter’ would never have arrived. And even though Elvis’ letter was returned to sender, at least he got it back, given our current postman’s attitude, he would probably have dumped it behind a bin somewhere or delivered it to someone else instead. Although old fashioned and fairly risky, at least Stings method didn’t involve any queuing, just a bottle and a river. And R.E.M. would never have this problem because they never sent their letters. Family and friends, I’ll try to do some queuing before Christmas so you might get some presents this year. As the Beatles sang, "Please Mr Postman,... I've been waiting so patiently."